The Syrian Arab Air Force's Hip fleet is perhaps best known for its leading role in the indiscriminate bombing of civilian areas across Syria with what have popularly become known as barrel bombs, an act that has defined the usage of aerial assets during the Syrian Civil War. 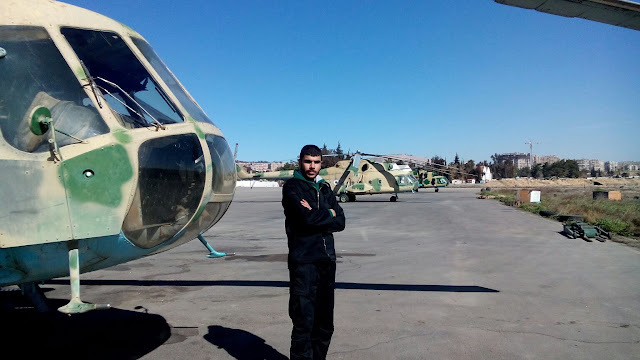 While the role of makeshift bomber currently remains one of the main tasks of Syria's Mi-8/17s, other roles the Hip fleet has carried out during the past six years of brutal war have been largely underreported. Perhaps the most significant role of the Hip fleet is that it represented a lifeline between regime-held Syria and besieged army garrisons across Syria, which had been completely cut off by road for sometimes up to several years. The Mi-8/17s could, contrary to transport aircraft, land to bring in reinforcements or transport the wounded to hospitals. Indeed, the city of Deir ez-Zor was at one time completely dependant on Syria's fleet of Hips for bringing in reinforcements and evacuation of the wounded and civilians. In addition to its role as a transport helicopter and makeshift bomber, several of Syria's Hips have been upgraded for tasks that remain largely unknown to the general public. 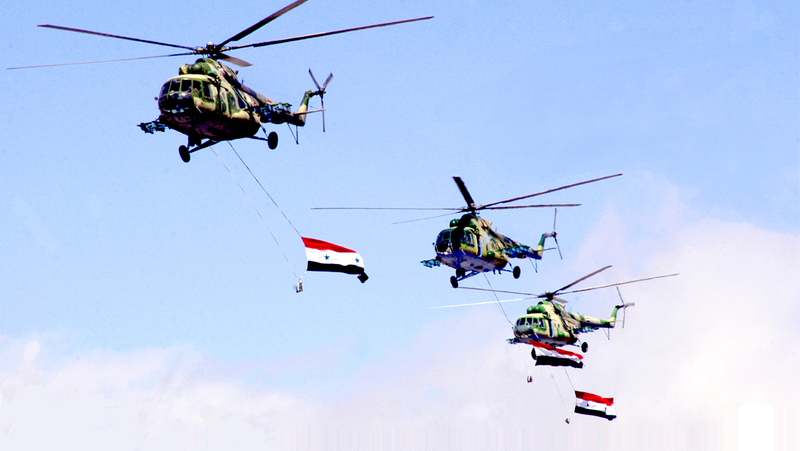 While it is unclear if some of these helicopters continue to see service in their new configuration, it is certain that they represent an interesting albeit underreported chapter of the Syrian Arab Air Force (SyAAF), which will be the subject of this article. 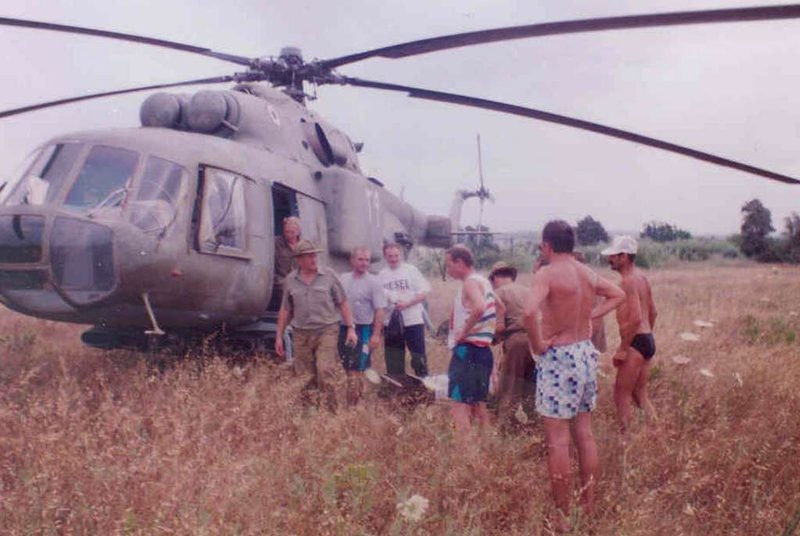 Before going into detail on Syria's upgraded Mi-17s, it is of interest to mention that the first 'Special Purpose' Hips had already arrived in Syria in the early 1980s, shortly after the conclusion of the main phase of the 1982 Lebanon War. The SyAAF and Syrian Arab Air Defence Force (SyAADF) had suffered severe losses to the Israeli Air Force during aerial combat over the skies above Lebanon, where Israel fully exploited its superiority in electronic warfare. Unable to respond in a similar fashion with any of the equipment Syria then operated, Hafez al-Assad turned to the Soviet Union for assistance. Eager to test its Mi-8 electronic warfare variants, the Soviet Union subsequently deployed up to eight Mi-8PPAs, Mi-8MTP/Us and Mi-8SMVs to Syria, where they were based at T4 airbase with regular detachments to Mezze airbase, located closer to the Israeli-occupied Golan Heights. These helicopters were tasked with jamming the guidance radars of enemy surface-to-air missile systems (SAMs), and might have been pitted against Israeli MIM-23 'Hawk' SAM sites during peacetime before they returned to the Soviet Union at the end of the eighties, ultimately ending up in a helicopter boneyard. Back to Syria, where the vast majority of the SyAAF's Mi-8s and Mi-17s continue to operate in their original configuration, often with their rear doors removed to allow for easy loading and dropping of so-called barrel bombs (which by today's standards actually consist of more sophisticated designs that have little to do with barrels). The fact that several of the SyAAF's Hips had been upgraded was first hinted at shortly after the capture of Taftanaz airbase on the 11th of January 2013, resulting in the loss of more than a dozen Mi-8/17s and Mi-25s. Taftanaz was the second heliport to be overrun by the rebels, following the capture of Marj as-Sultan heliport on the 25th of November 2012. Despite frantic efforts for a last ditch evacuation with some of the helicopters located here, the loss of Taftanaz represented the first major blow to the SyAAF, losing almost as many Mi-8/17s as there are operational airframes today. Careful examination of the airframes captured here revealed the addition of an electro-optical system under the fuselage of one of the Mi-17s. 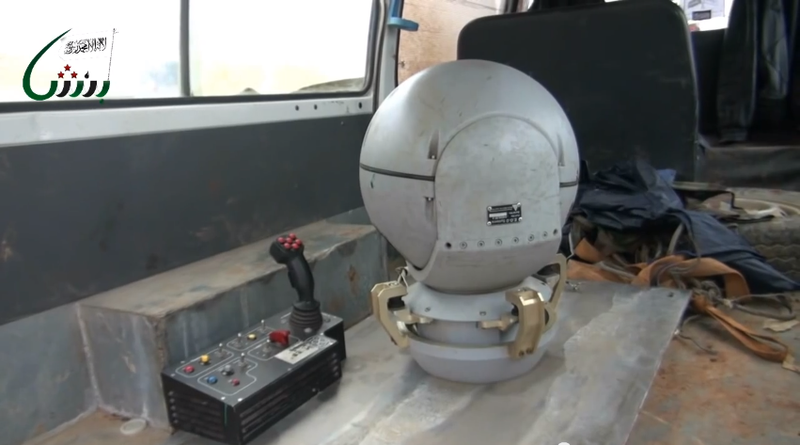 Later footage from Taftanaz would also show a dismounted electro-optical system and its associated control panel. Another image taken in 2013 at Mezze airbase would also give us the first good view of the armoured panels protecting each side of the cockpit. Interestingly, this relatively simple addition aimed at increasing crew survival has only been applied to a small number of helicopters. As these upgraded helicopters have only been sporadically sighted during more than six years of war, it is likely that only a few Mi-17s were upgraded to this new standard before the outbreak of the Civil War. Differentiating these upgraded Mi-17s from other non-upgraded Mi-17s helicopters remains difficult however, as is witnessed by this example. It might be easy to mistake this helicopter for one of the regular Mi-17s in use with the SyAAF's helicopter forces, but the hardly visible armoured panels on the cockpit and electro-optical turret serve to differentiate it as one of the upgraded examples. 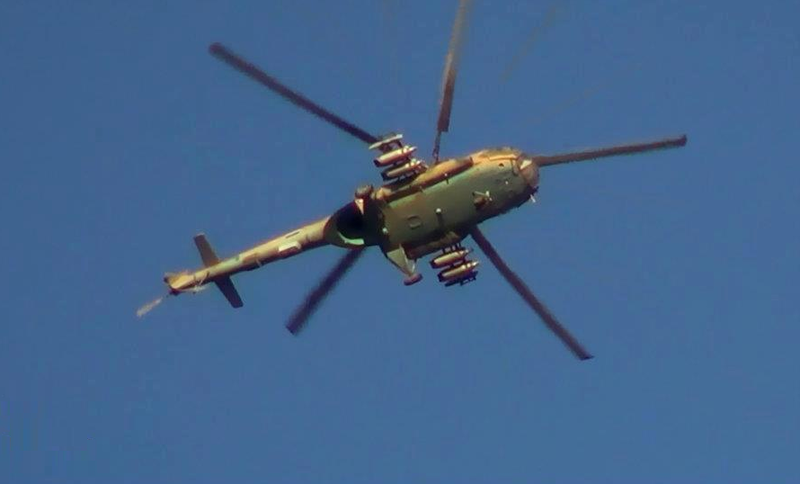 While Syria's Mi-17 already come equipped with three hardpoints on either side of the fuselage, allowing for the installment of rocket pods, bombs or as in the case above, a 23mm UPK-23 gun pod, the addition of an electro-optical system would significantly increase the helicopter's capabilities in target acquisition and threat identification. In turn, the armoured panels installed around of the cockpit increase the survivability of the helicopter crew, a welcome addition to the anti-aircraft weapon rich environment of Syria. 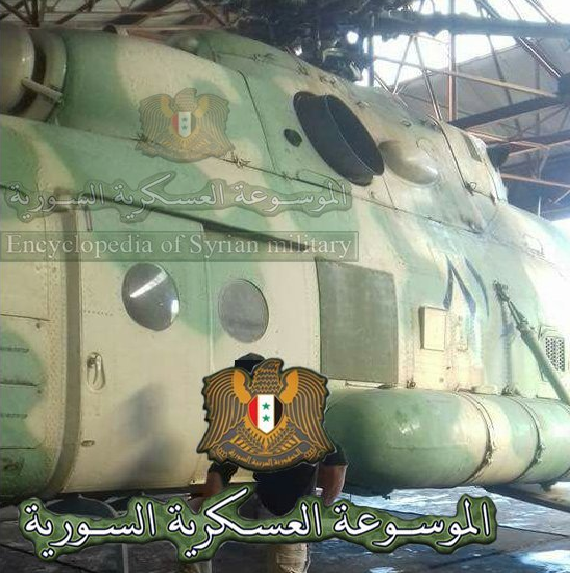 It is highly likely that these upgrades were carried out by the SyAAF's overhaul and maintenance facility 'The Factory' at Neyrab/Aleppo IAP, which has also been responsible for the design and production of the indigenous chaff/flare launchers mounted on nearly all of the SyAAF's Mi-8s and Mi-17s. The electro-optical system seen in detail below and the armoured panels are believed to have been acquired from Iran, which has carried out similar upgrades on its helicopters. Other specialised Mi-17s have been used for less lethal tasks, such as the transportation of very important persons (VIPs) across the war-thorn country. As movement from one side of Syria to the other by road has meanwhile become impossible or too time consuming to allow for rapid deployment across the country, Brigadier General Suheil 'The Tiger' al-Hassan has often made use of a Mi-17 configured as a VIP transport to allow him to swiftly cross long distances. 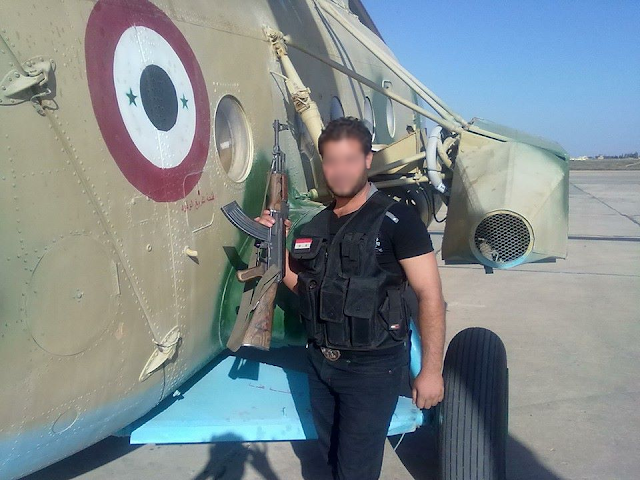 The SyAAF already operated several Mi-8Ps (identifiable by the rectangular/square windows instead of the round windows found on normal Mi-8/17s) for VIP transport, but had already retired these before the outbreak of the Syrian Civil War. President Bashar al-Assad makes use of two VIP helicopters of his own, which will be covered on this site in a later article alongside his other VIP aircraft. While the tasks of the aforementioned helicopters are relatively straightforward, the SyAAF also operates at least two Mi-17s airborne jamming platforms for the jamming of enemy air defence radars. First seen during a large-scale Syrian Arab Air Force exercise in July 2012, the first type was seen equipped with two oddly shaped containers installed on either side of the fuselage. While the exact purpose of these containers remain unknown, it is now believed that they are part of the North Korean TACAN electronic jamming system installed onboard at least one SyAAF Mi-17. The TACAN electronic jamming system was reportedly (quoting statements from a Syrian defector) used against a Russian crewed SyAADF Pantsir-S1 self-propelled anti-aircraft system in a series of test taking place in early 2012. This test came after Syrian complaints regarding the Pantsir-S1's ability to cope with electronic countermeasures, which are heavily employed by the Israeli Air Force during their raids against Syrian military installations. While the Soviet Union's and Russia's standard response to criticism on its military hardware has been to blame the operators and not the quality of the hardware itself, the Russians suffered a serious blow when the TACAN electronic jamming system successfully managed to jam the Pantsir-S1 during the 2012 test. Despite the Pantsir-S1's supposed ability to deal with heavy electronic countermeasures, the Russian crew's efforts to evade the jamming were in vain. 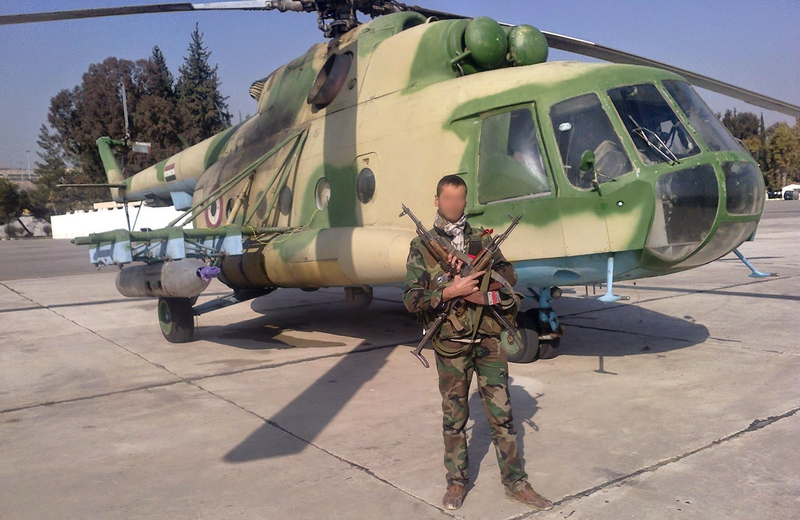 Arguably the most interesting helicopter to serve in Syria is also the most mysterious; just one example is believed to have entered service with the SyAAF. 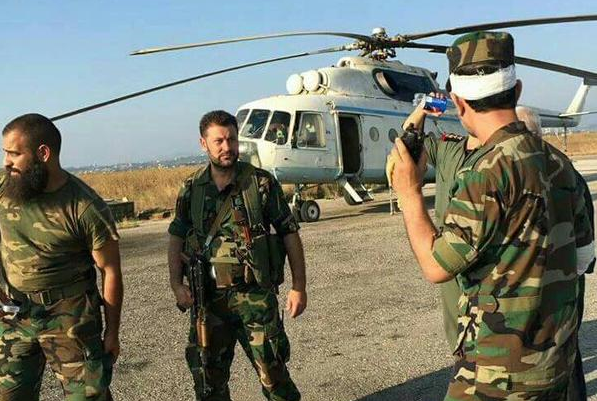 This Mi-8MT (Russian military designation for the Mi-17) '2981' was only seen once: General Ali Abdullah Ayyoub, the Chief of the General Staff of the Syrian Arab Army, examined it during a visit to Bley airbase in July 2015. The Mi-17 stands out because of its newly applied camouflage pattern, which has not been seen on any other Mi-8/17 in Syrian service. The green square on the right side of the fuselage would provide the first major clue to the origin and mision profile of the helicopter. Mi-17 '2981' actually constitutes the SyAAF's sole Mi-8MTPR1 airborne jamming platform, delivered to Syria in 2013 as 'Mi-8MT with L187AE'. The Mi-8MTPR1 is equipped with the L187A Rychag-AV jammer for jamming air defence radars and is one of the most advanced Russian airborne jamming platforms on the market. However, with a future air war against Israel becoming increasingly unlikely, and of little use in a Civil War that has seen no real threat of jammable enemy air defence systems, the Mi-8MTPR1 has effectively been relegated to the status of white elephant in the SyAAF fleet. 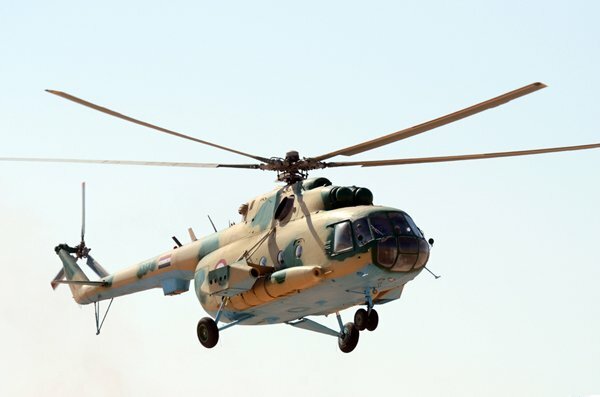 As the Syrian Civil War has entered its seventh year, the SyAAF's Mi-8/17s Hip fleet remains at the forefront of the regime's aerial campaign against its opponents. While the effectiveness of these helicopters as makeshift bombers can be questioned, the Hip has once again proved to be the reliable workhorse it is well known for. Although the number of operational airframes continues to shrink through attrition, the adaptability and multifunctionality of the Mi-8/17 airframe ensures it will remain in use until the very end, undoubtedly even outlasting the Syrian War. 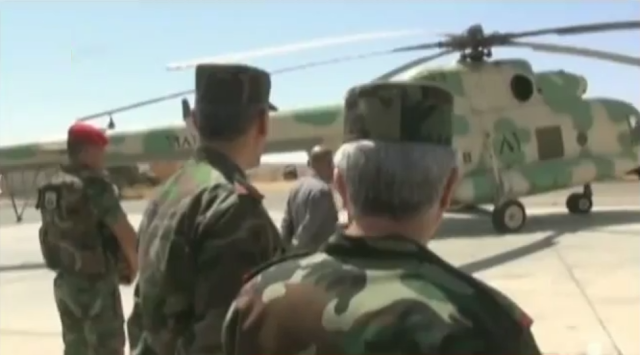 Some gues about curent number of operational Mi8/17 helicopters in SyAAF ? Have they tried to get anymore? As useful as they are, I'd expect them to make efforts to at least replace the ones they lost. 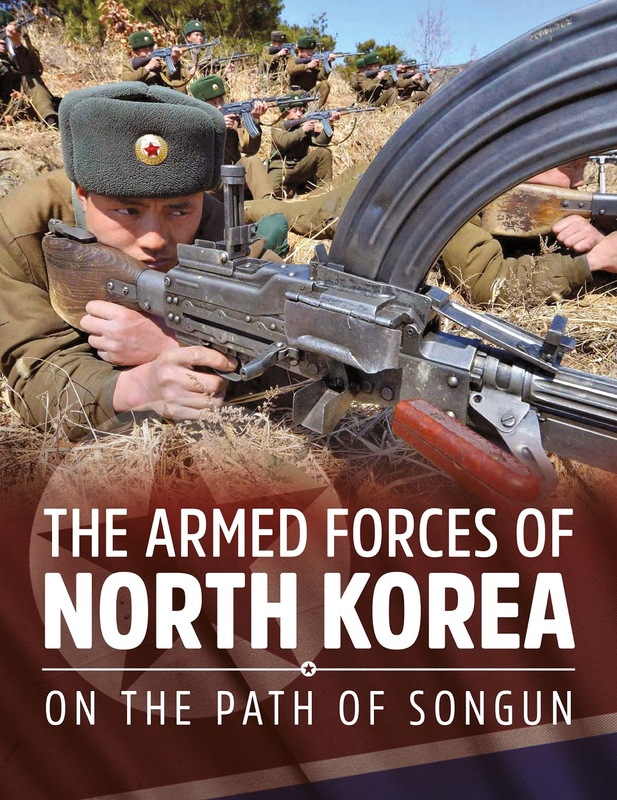 Is North Korea known to utilize jamming systems? The air defence jammer could be used to blind Israeli radars necessary for hard kill defences and civil defence alerts against Hezbollah rockets. Well, it could jam in such a role for a few hours.